Pearl millet (கம்பு) has been used in India for nearly three millennia. It is rich in carbohydrate, protein, dietary fiber, vitamins mainly B complex, and minerals especially phosphorus and potassium. Pearl millet flour is light brown in color and is available in most grocery stores. You may alternatively grind pearl millet in a neighborhood flour mill. Though pearl millet can be soaked in water and ground into a paste, I prefer using pearl millet flour for convenience. In south Indian cuisine, pearl millet is used to make dosa, adai, rice, porridge and roti/chappati. Pearl millet adai is nutritious, tasty and quite filling. How to prepare the batter: Wash urad dhal, Bengal gram dhal and toor dhal, and soak them in sufficient water in a container for 4-5 hours. Grind the soaked items with salt, asafoetida, red chillies and required water using the wet grinder or mixer-grinder into a thick paste. Mix pearl millet flour with 1 tumbler (200ml) of water into a smooth paste. Add the ground batter to the millet flour paste. Mix well. Add water, if required, to make the batter into pouring consistency. Add curry leaves and mix well. Please note that this batter should be thicker than dosa batter. You can make adai immediately. You may refrigerate the batter and use it make adai as needed. Note: Adai batter NEED NOT be left outside to ferment. 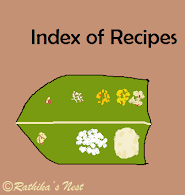 Store the batter in the refrigerator soon after grinding, if you do not intend to make adai immediately. How to prepare Adai: Mix the batter well before using. Heat the tava on medium flame. Once ready, spread the batter evenly on the tava. You won’t be able to spread the batter thin owing to the consistency of the batter. This adai will be thicker than dosa. Add oil around the adai and allow it to cook for a minute. You will find the edges of the adai start to become golden brown. Turn the adai over and cook for short while. Remove from the tava and serve hot with chutney. Traditionally pearl millet adai is served with spinach gravy (கீரை கூட்டு). This adai also goes well with coriander chutney. Note: You may add chopped onions or drumstick leaves (முருங்கை கீரை) to adai batter, mix well and prepare adai. Alternatively, you may use finger millet/ ragi flour (கேப்பை மாவு) or corn flour (சோள மாவு) instead of pearl millet flour and make ragi adai (கேப்பை மாவு அடை) or corn flour adai (சோள மாவு அடை) in the same manner.